Selling our company values and professional services are Priority #1. The equipment we sell is secondary. We are in the business of helping our customers, potential customers and the dairy industry. Years ago we recognized the need in our area for dairy facility design services. Central Ag Supply offers a unique approach in dairy facility design, production of CAD (computer assisted drafting) drawings, and project management assistance. Our Central Ag Supply's knowledge and ability to help a customer goes far beyond just milking equipment. Whether it walks on 2 or 4 legs, we understand all the needs of an entire milking facility. We understand the requirements for financing budgets, site evaluation, building construction, concrete, barn equipment, manure handling, ventilation, electrical, plumbing, HVAC, as well as the many other equipment and construction components for the entire facility. Central Ag Supply's design focus is to make sure all the equipment and construction components involved in the project are integrated together properly and will be installed or constructed in the most cost effective and efficient way possible for ALL contractors involved. Historically, for many Midwest dairy facility construction projects, the process does not always follow the path or guidelines as you would see in the commercial facility construction process. Unfortunately, it is not uncommon for dairy industry projects to "get the cart ahead of the horse". 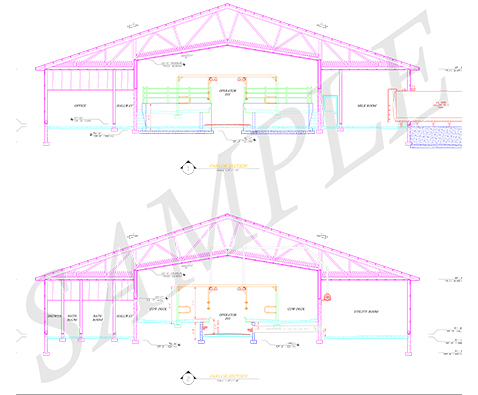 In the "commercial construction world", the process of a new project or remodel, generally starts with the owner hiring a designer to produce a "basic" CAD layout drawing that reflects the ideas and visions of the owner. The owner and designer, alone, work back and forth molding and shaping the ideas and visions until they, together come up with an "Agreed Final Layout Drawing". Up until this time, potential contractors, builders, or trade contractors are generally not contacted. Using the "get the cart ahead of the horse" method, causes problems throughout the project process, from the concepts, drawings, bidding, financing, start of construction, completion of project, and most importantly, a satisfactory final product. Bid request from contractors before an "Agreed Final Layout Drawing" is completed, simply forces all potential contractors to make their own conclusions or "guess" on how to bid their portion of project. When a final agreed layout is completed and all the contractors are asked again, this time for a final bid, only delays the project process. Loan officers like to get the most accurate information they can upfront to avoid cost overruns. Proper planning ahead on drawings is the only way to minimize cost overruns. It is much easier to move a concrete wall on paper than it is after the wall is actually poured on site. Proper planning for any project should to begin somewhere around 12 months before your construction start goal. 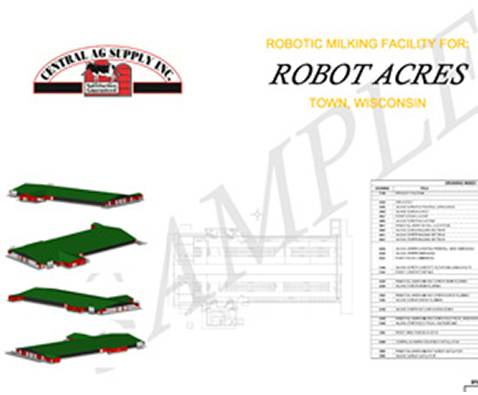 Let Central Ag Supply's design team help you bring your dairy facility dreams to life. A successful outcome of your dream is our dream. All plans furnished by Central Ag Supply does not make any representations or warranties, expressed or implied as to the efficiency of the system depicted in all drawings or its appropriateness for use in your business. These plans and the construction of the depicted facility are subject to various building codes, ordinances, and regulations of state, county city and other governmental units. Compliance with such codes, ordinances, and regulators are the Customer's Sole and Exclusive Responsibility. Prior to any construction, it is the customer's sole and exclusive responsibility to have all dimensions and specifications in these plans examined and approved by a registered architect and/or an agricultural/building engineer. Central Ag Supply Inc. does not imply to be a building contractor, a general contractor, nor to provide engineered construction drawings and does not assume any responsibility for the use of these drawings by any contractor involved in the construction of the project. 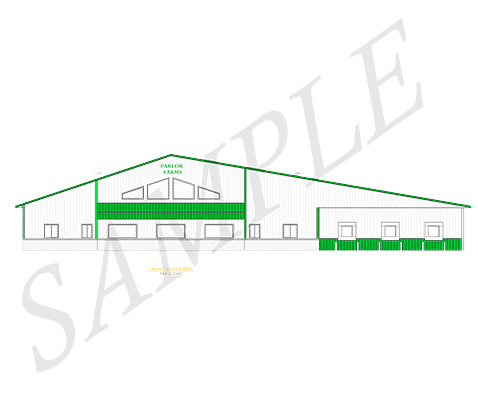 Central Ag Supply Inc, is not obligated by any means to provide any drawings other than the actual equipment dimensions for the equipment provided by Central Ag Supply Inc. It is to be understood that Construction/Engineered drawings for the project are to be provided by the appropriate contractor or general contractor. Without the hiring of a general contractor or having formal construction/engineered drawings, all risk of any construction mistakes and the responsibilities of coordinating all contractors and subcontractors are assumed by the customer and/or builder. Although every effort has been made in designing and preparing these plans and checking them for accuracy, the installer, owner, or contractor involved must verify all details and dimensions and assume responsibility for any changes or adjustments required during actual construction. No representation is made or implied for accuracy. Central Ag Supply Inc Drawing Copyright. Copyright Central Ag Supply Inc. It is unlawful for anyone or party to use or reproduce by any means all or any portions of these documents without the expressed written permission of Central Ag Supply Inc. All drawings and all information contained herein remain the property of Central Ag Supply Inc.